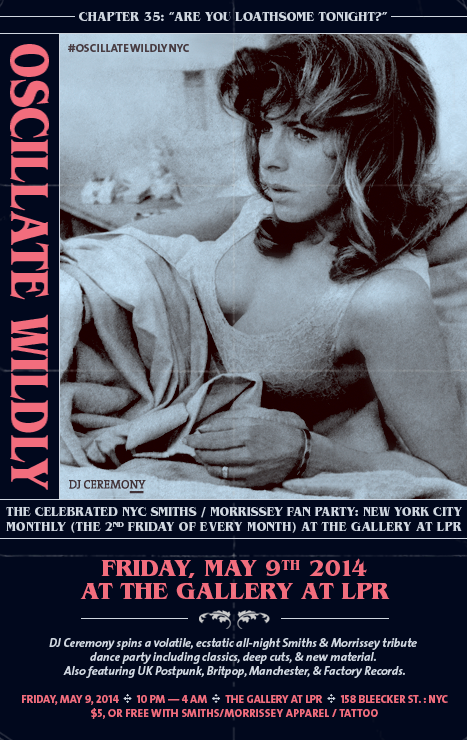 Friday, May 9, 2014 at The Gallery at LPR. 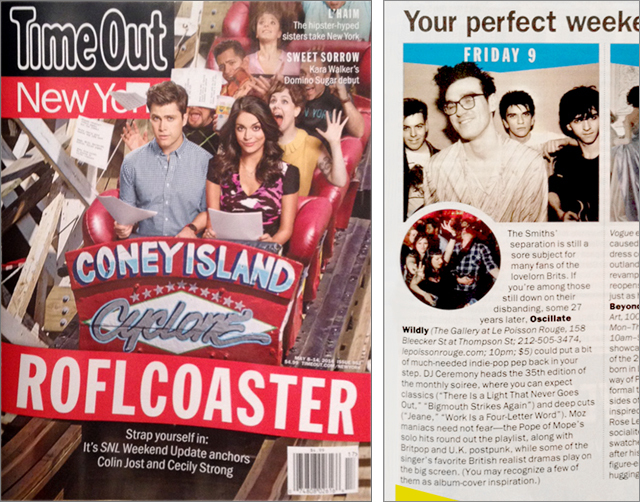 The fine folks at Time Out New York have just declared May 9th’s “OSCILLATE WILDLY” party the official kick-off to your perfect weekend. I have to say I couldn’t agree more! Event photo by Tom Egan. Calling all handsome devils & unruly girls who will not settle down! Every 2nd Friday of the month, DJ Ceremony presents a kinetic all-night celebration of the sounds of The Smiths & Morrissey, from the most celebrated classics to the deepest cuts. Also featuring UK Postpunk, Britpop, Manchester, & Factory Records. Prepare to dance your legs down to the knees! • 21 & up. $5. • Free admission with Smiths/Morrissey item of clothing, or Smiths/Morrissey tattoo! Dress: Brigitte Bardot, Alexandra Bastedo, Truman Capote, James Dean, Steve McQueen, Nico, Edie Sedgwick, Sandie Shaw, The Silver Factory, Paul Weller, Oscar Wilde, Natalie Wood, minor extra from the “Stop Me” video. 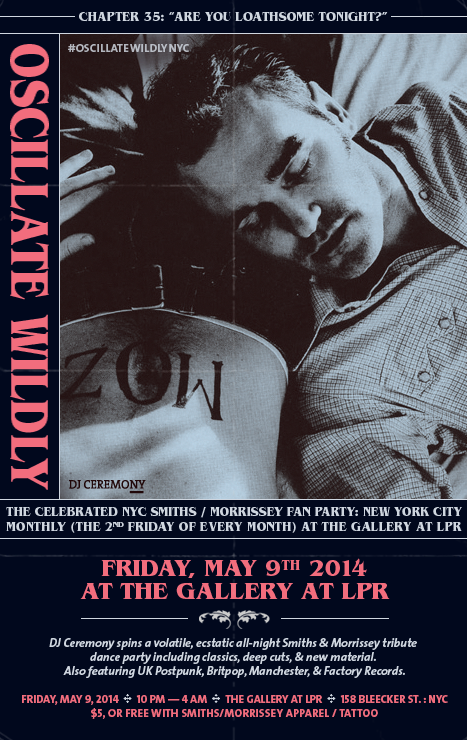 Friday, May 9, 2014 — 10:00 p.m. to 4 a.m.
Join the “Oscillate Wildly” NYC Facebook group for future updates. Best Smiths / Morrissey fan party in NYC!